Palomar Technologies modern bonding systems have a multi-decade history, with system software that has been continuously improved upon in large and small ways over the years. Other than improving reliability and stability, the software has mostly been improved and expanded by the addition of various features. Customer experience and input is a significant part of software feature development. Some customers present desired features with very specific ideas for functionality or implementation. Many customers contribute feature ideas as a problem or process issue they are trying to solve. The customer interactions with Palomar by way of Sales, Field Service Engineering, Applications Engineering, or Assembly Services are all entry points for software improvements and enhancements. Palomar Technologies’ own internal bonder system users, especially Applications Engineering and Assembly Services, have a highly interactive relationship with Software Engineering. Internal applied testing of new features as well as development of feature ideas are critical parts of Palomar’s software development process. Highlighting a couple of features added to the bonder system software can help to illustrate some of the dynamics involved in acquiring, developing, and releasing new features. When the 8000 Wire Bonder software was first created 20 years ago, there was a conspicuously empty space to the right of the part program tree display area. This area was intended to be used as a graphical representation of the loaded part program. At the time, graphical displays of part programs or recipes in the semi-conducting manufacturing robotics space was unusual. It was computationally expensive and took away resources that were best targeted to the processing of part program sequences in a timely and efficient manner. The Software Engineering team and other internal wire bonder experts at the time felt that it would be a great feature, but that engineering resources would be best used on core wire bonder features. It was not being driven by any customer need at that time. Several years ago, a reexamination of the need for a graphical program display was performed. More customers were mentioning a desire for some type of part program display. Some customers would have been satisfied with a static part program layout. Other customers wanted more dynamic real-time display features, especially with some sort of representation on the live video display from the look-down camera. The Palomar Sales group and Applications Engineering were critical in conveying the level of customer interest and the types of functionality expected out of the proposed new feature. After many engineering hours of work, internal software prototypes were made available for evaluation by various internal Palomar groups as well as some highly interested customers. Design and implementation issues were resolved with further development and continued feedback from the users. 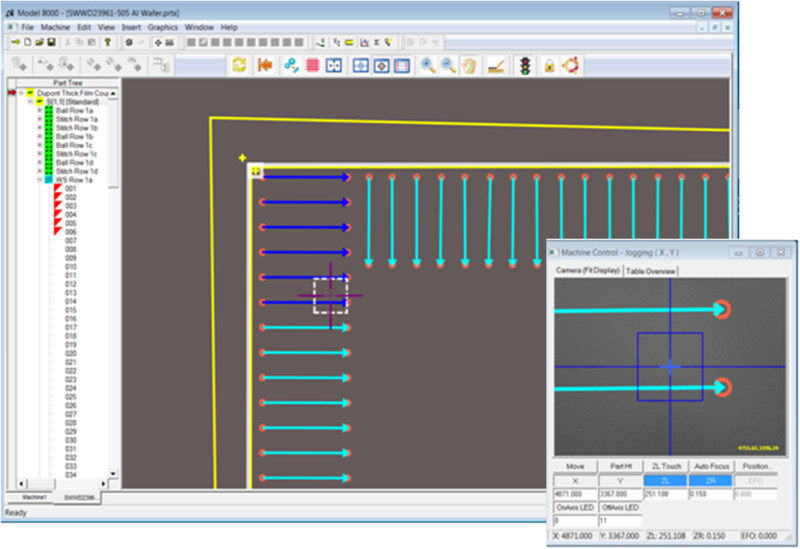 When the i2Gi feature was determined to be at an acceptable level of functionality, it was released in the 8000i Wire Bonder system software. When the 9000 Wedge Bonder was released, it was also able to take advantage of the new graphical display feature. The full screen Program Graphical Display satisfied the needs of an overall part program layout. The live Video Graphical Display satisfied the need for a real-time overlay of the part program components. The reception by customers was very positive, with many agreeing it was the best implementation they had seen in any other comparable system. The addition of the i2Gi feature is a major milestone in the continued improvement and enhancement of the Palomar bonder software. This feature continues to be developed, reflecting significant customer usage feedback over many years. Some newer customers have never experienced a Palomar wire bonder without this feature in place and many older customers have upgraded specifically to gain access to this feature. 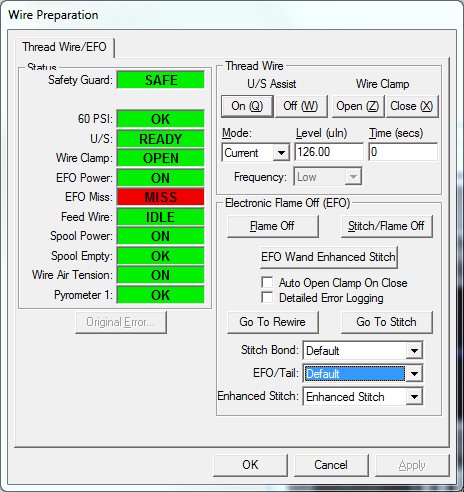 In a very recent release of the 8000i Gold Ball Wire Bonder software, a new type of stitch-off feature was added to the wire preparation: Thread Wire/EFO screen and the corresponding internal software controlled wire sequences. Palomar Technologies’ own General Manager of Assembly Services, David Rasmussen, had gotten feedback from a customer about our existing “stitch-off” wire preparation sequence. In certain flame-off error situations, the customer operators were having to manually push or “knock” an exposed length of wire away from the tool tip before performing stitch off. This was done with tweezers—a common tool used in wire bonding—but it was resulting in marks on the tool and inconsistent wire control due to the very small working dimensions. With input from the customer and his own deep history of wire bonding experience, David helped to devise a new stitch-off sequence that would eliminate the manual wire knock intervention. Software Engineering then took up the task of developing the sequence. Further refinement of the sequence was accomplished with review by David and other members of the engineering staff. This new feature is “small” in the sense that the changes to the user interaction screen were minimal – an additional button and a drop-down list box. Internal changes to the software were also small, requiring about 2 weeks of review, development, and documentation time. Despite the “smallness” of this feature, it should be a valuable new addition to the software for all users of the 8000i Wire Bonder. Palomar Technologies is constantly looking to improve the capabilities and user experience of all of its bonder systems: the 8000i Wire Bonder, 9000 Wedge Bonder, 3880 Die Bonder, 6500 Die Bonder, and all complimentary and accessory systems. There are continuing improvement projects under way on all platforms and software improvements and feature additions are an integral aspect of most of these projects. Where is the Future of the Semiconductor Industry Headed?